The example below demonstrates creating a hierarchical grid presenting two tables Product Category and Product Information. Figure 1: The final result from the tutorial. Drop a RadGridView control on the form. Set the RadGridView.Dock property to Fill in the Properties window of Visual Studio. 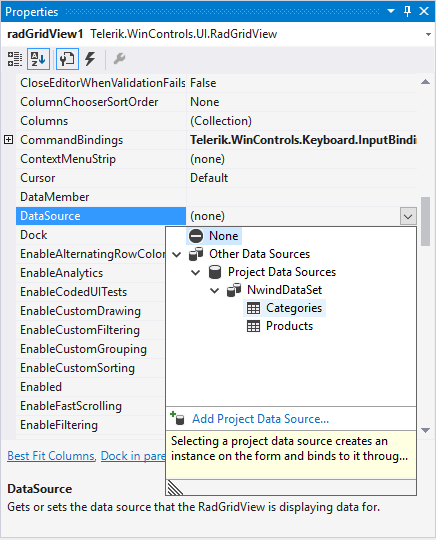 Open the DataSource property drop down in the Properties window of Visual Studio and select Add Project Data Source. This step will open the Data Source Configuration Wizard. 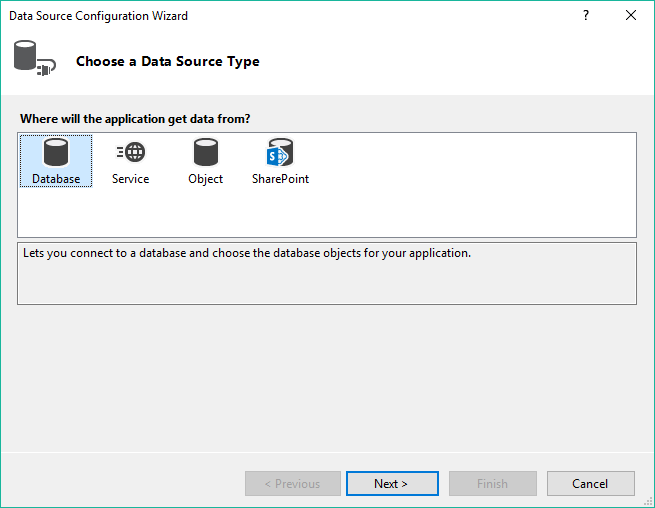 In the Data Source Configuration Wizard, Choose a Data Source Type page, select the Database icon, and click Next. In the Choose Your Data Connection page of the wizard, click on the New Connection... button. This page displays the Add Connection dialog. In the Add Connection dialog, click on the Change... button. This will display the Change Data Source dialog. In the Add Connection dialog, click on the Browse... button. This step will display the Select Microsoft Access Database File dialog. In the Select Microsoft Access Database File dialog, navigate to Telerik UI for WinForms installation directory and locate the Nwind.mdb file within the \Examples\QuickStart\Datasources directory. Select Nwind.mdb and click OK to close the dialog. In Choose Database Objects page of the dialog, select columns from the Categories table: "CategoryID", "CategoryName" and "Description". Select columns from the Products table: "ProductName", "CategoryID", "UnitsOnOrder" and "Discontinued". Click the Finish button to close the Data Source Configuration Wizard. 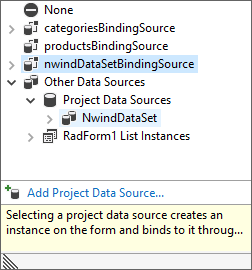 In the Properties window of Visual Studio, open the DataSource property drop down and select Categories from the NwindDataSet data source. This step will create categoriesBindingSource and categoriesTableAdapter components. Select the DataSource property drop down a second time and select Products from NwindDataSet data source. This step will create productsBindingSource and productsTableAdapter components. 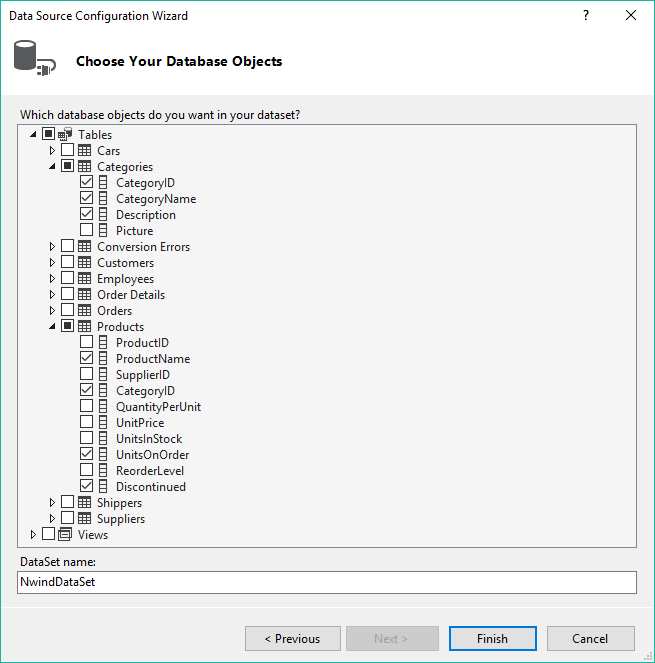 Select the DataSource property drop down for the third time and select NwindDataSet. This step will assign the entire dataset to the grid. In the Properties window of Visual Studio, set the DataMember property - select Categories from the drop down list. 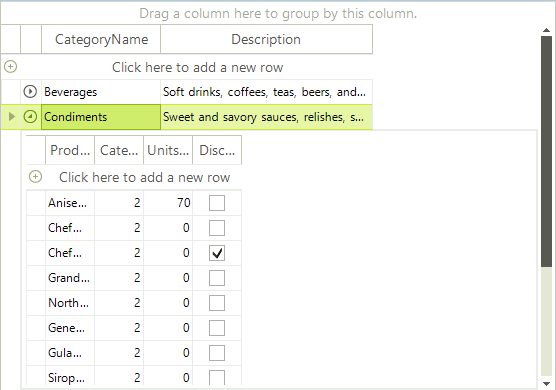 This step will assign categories as a top level table for the grid. In the Properties window, set AutoGenerateHierarchy to True. From RadGridView smart tag, select Open Property Builder. In Property Builder Structure pane, de-select CategoryID checkboxes. Close the Property Builder window. Press F5 to run the application. Notice that the grid first displays product categories. Each category has an icon that can be clicked to expand that category and show a child template with the corresponding products.